We had a really great day today. We did ton of stuff, but it didn't seem like one of those frazzled days where you can't catch your breath. We started our dental health theme today. 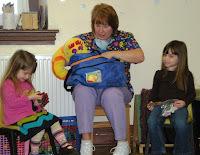 We talked about many aspects of healthy teeth: brushing, flossing, eating good foods, and visiting the dentist. We even had a visitor today. 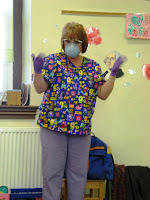 A dental hygienist from a local dentist's office came to see us today. Miss Kathy was really great. 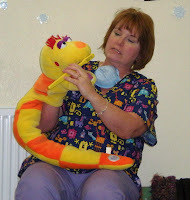 She showed us what the dentist and the hygienist would look like at the dental office. She had her mask, gloves, and goggles. Our favorite part was when she introduced her special guest--Sam. 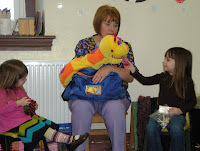 Sam was a big snake with a mouthful of teeth. She showed us how Sam brushes and flosses his teeth to keep them healthy. Then Sam, the class, and a special couple of teeth helpers decided if the snacks Sam brought made for "happy teeth" or "sad teeth." We had a great time. 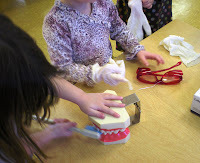 During free time I had out some gloves, goggles, floss, toothbrush, and our big teeth for the children to practice their dentistry skills. It was really cute. 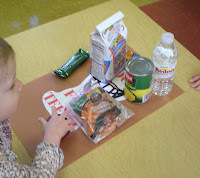 I also had brought in some food from home to have a sorting table. 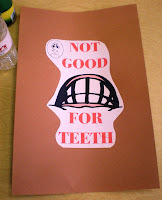 I had made two signs; one to keep teeth healthy, one not so healthy. The children had to decide which food went where and place it on the right sign. We did this all together at circle time first so they would know what they were doing. 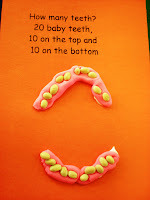 We also talked about children having 20 teeth, 10 on top, 10 on the bottom. 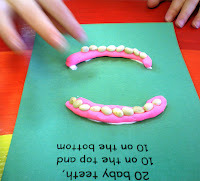 We also discussed that the pink part our teeth come out of is called our gums. This is where our craft came in today. We made a "mouth" with 20 teeth in it. I had run the poem on some construction paper. I ran two poems on one sheet of paper, then cut them in half. I gave the children two small balls of the pink Play Doh and had them make some short snakes. 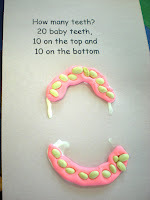 We glued the snakes to the paper for our upper and lower gums. 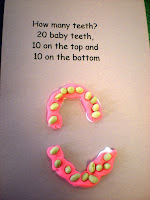 The children then had to put 10 bean teeth on the top and 10 bean teeth on the bottom. Because the beans are pretty small this was a great fine motor activity. I only had 2 that had a little trouble picking up those beans. Anne over at Teaching Two said she made a similar activity: she made a big red smile and then the kids glued white beans in two rows of ten. The book we read today was "Going to the Dentist," by Anne Civardi, illustrated by Stephen Cartwright. 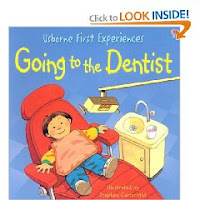 It's a cute story about two little children taking a trip to the dentist and what takes place while they are there. It can get a little dicey for some of the children as the one little boy has a cavity and he has to get a shot to numb his tooth before the dentist fixes it. They asked if it hurt, but I explained, as did the book, the dentist uses something to numb the area first. It's a good book though, very detailed, specific, but written child friendly. You can also find the book from the great author of Literature Links too. Hey, I sell that book- Going to the Dentist, so if anyone wants it- send them my way! What great ideas! My sons and I are covering a community helpers theme and including information on what a dentist does. 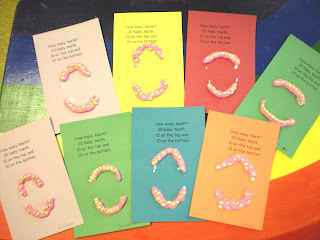 I would love to make the teeth and gums craft you posted. For science, we are doing the egg shell soaked in Coca-cola and then brushing it with toothpaste to learn about dental care. Thank you for sharing your ideas! Hi, I loved reading this blog and am sure my son will love the idea of making the craft you have posted here. Will surely try it out. We make play dough at home so it will be double the fun for him.